Drafting or carting are terms used to describe the activity of harnessing your dog to some type of vehicle and having them pull it. The vehicle can be a simple two-wheel cart, a four-wheel wagon, a sled or even a vehicle you ride in! The important thing is that this can be a very enjoyable and rewarding activity for both you and your dog. You can practice and train in your yard or a nearby park and simply enjoy working with your dog and enjoying their companionship. If you want to do more, you can decorate your drafting vehicle and enter local parades or you can even earn drafting title. Special thank-you to Marietta Mennone for her asssitance in developing this course. 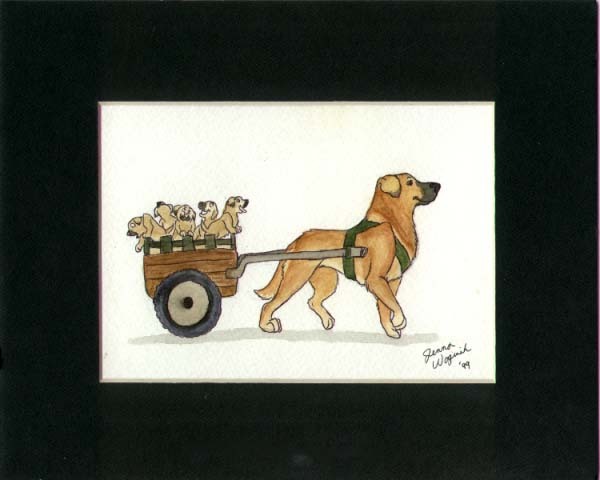 “Draft Work” refers to an activity where a dog is pulling something – a cart, a wagon, a sled, or even a log. “Carting” refers to an activity where the dog pulls a wheeled vehicle with the handler walking alongside the dog, and “Driving” refers to carting activity where the person controlling the dog rides in the vehicle being pulled. Your Leo can carry a small pack of his own food, and maybe some of your own personal items, while accompanying you in the back-country. If you are allowed to bring dogs to your college classes, you can have the dog carry a small backpack with a couple of books in it. This can be a great asset if you have disabilities or maybe an accident has temporarily hampered your activities. A dog can pull a tarp attached to his pulling harness to transport yard clipping to the curb to be recycled. Collect firewood in rural areas. Leos can be used at the holidays or birthday parties to give small children rides in their cart. Participate in club-sponsored food drives, by going door-to-door with the dog and cart, to collect food for community outreach programs. 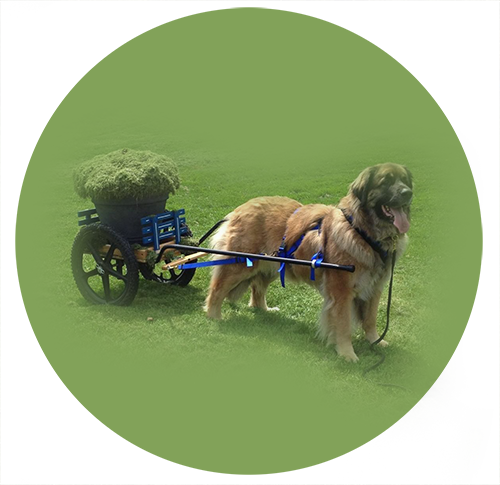 Use the dog and cart in pet therapy programs. Use the menu on the right to investigate this wonderful activity further. And handle our carting dog through this downloadable maze.